Cloud procurement presents an opportunity to reevaluate existing procurement strategies so you can create a flexible acquisition process that enables your public sector organization to extract the full benefits of the cloud. 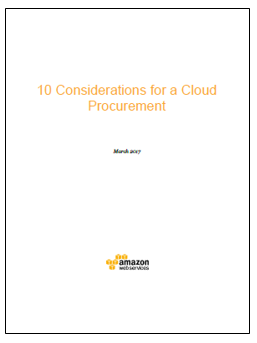 Download the whitepaper for “10 Considerations for a Cloud Procurement” for the public sector. Are you ready to move to the cloud but looking for practical guidance? The following are key components to help streamline your cloud procurement strategy. Take a look at the tips below and download the full whitepaper here for more details. Thousands of public sector customers use AWS to quickly launch services using an efficient cloud-centric procurement process. Keeping these steps in mind will help you deliver more quickly on citizen-, student-, and mission-focused outcomes. For more detail, visit the AWS “How to Buy” page for the details you need to get started. Check out the latest procurement sessions from the AWS Public Sector Summit in Washington, DC: So You’ve Decided to Buy Cloud, Now What? and Get Started Today with Cloud-Ready Contracts for practical insights that will help you along your path.